Empowering students to intentionally pursue education as a key to personal success and societal improvement. 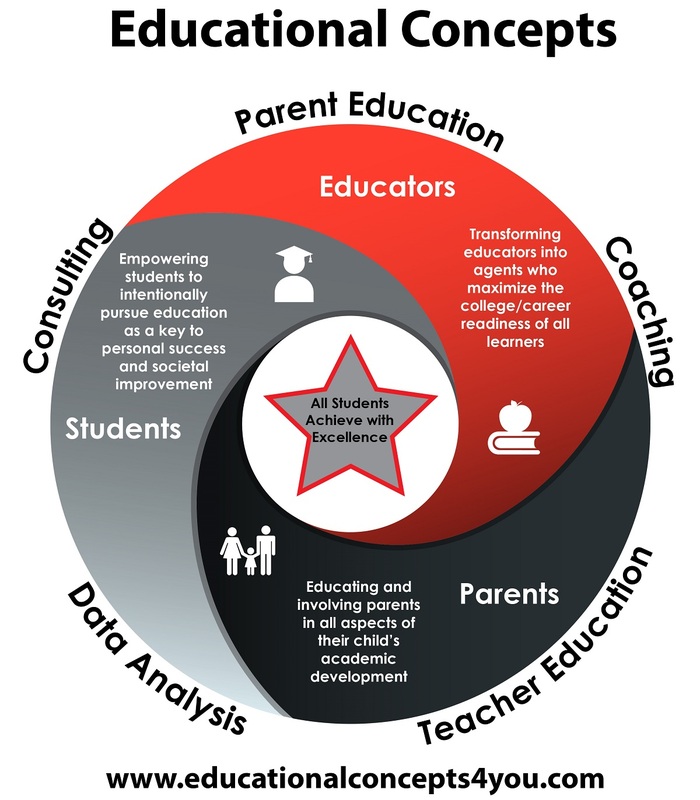 Educating and involving parents in all aspects of their child’s academic development. Transforming educators into agents who maximize the college/career readiness of all learners. Educational Concepts offers a number of publications designed to assist teachers and parents in fostering academically successful children. Our diverse workshops are widely effective in changing school climate and increasing parent involvement. We offer workshops specifically designed to assist parents in effectively supporting their children. Climate, parent involvement and cultural responsiveness surveys custom designed to meet the needs of your campus. All Educational Concepts consultants have been active in the academic learning and business community for more than twenty years and have earned doctorates in education. Our consultants have pioneered research on a variety of educational topics as evidenced through national and international publications, hundreds of workshops at professional conferences around the world, and private consulting services to a number of public and private institutions around the country. Our consultants are members of many professional organizations, and as a result, remain abreast of the academic needs of diverse learners. CHECK OUT OUR CUTTING-EDGE LEARNING STYLE APP!! Our new learning styles inventory app helps you to determine your individual learning styles. Complete with tips for success for teachers, students and business professionals, this survey will help you connect more with your own learning and that of those around you. Available on the Apple AppStore, Google Play and Amazon AppStore. "This book and Dr. Tanner's excellent professional development sessions have helped the staff on my campus to really change the climate and respond to our students in culturally responsive ways. It is a 'must have' in every educator's library." "I was amazed at how relevant this book is to our current experiences in education. It is an indispensable manual that I will refer to again and again." "This book provides an introspective view of age-old challenges still facing public education today. Dr. Tanner's book explores mental stigmas placed on children by educators who are not culturally competent and the unintended impact on these students that impairs their ability to reach their full potential. It is an excellent read for any educator committed to the success of ALL students." "Dr. Tanner is the voice of calm as he guides parents in developing insight into positive behaviors that will help their children learn how to effectively deal with difficult moments, unexpected loss, and in some cases traumatic change. As a professor and mental health counselor, I am often faced with trying to prevent children from becoming victims of mental health issues that arise due to irreconcilable differences between divorcing adults. Dr. Tanner's book serves as the recipe for reorganizing ourselves during change. His work provides a platform for the entire community to assist in saving our children." PRAISE FOR PARENTS NEED HELP TOO! "Dr. Tanner's book and workshops are making the difference we needed with our parents... Now that our parents and teachers are on board, gaps are closing!" "This is the best parenting guide I've read!" Educational Concepts, LLC is an equal opportunity employer. The Board and its agents, officers and team members shall not discriminate on the basis of gender, race, disabling condition, age, color, religion, national origin, military status, or any other legally protected status in making decisions regarding team members or clients. © 2018, Educational Concepts. All Rights Reserved.